One thing you don’t think electric cars can typically do is rally. Long distances, probably very few charging stations along the way—it doesn’t really sound like a place where an electric car can flourish. And then there’s this Nissan Leaf. Created by a company called Plug In Adventures, this is a modified Nissan Leaf that’s based on the standard 30 kWh version that had a 155-mile range on a single charge. Mods include Speedline SL2 Marmora wheels and Maxsport RB3 tires, welded plates beneath the wishbones, braided brake lines, mudflaps, an aluminum sump guard and a light bar up top. Weight reduction was the focus for the interior of the car. The back seats and seatbelts were taken out, while a fire extinguisher and a medical kit were placed in the trunk. The rally itself is the Mongol Rally, which stretches 10,000 miles from the UK to Mongolia, happening this summer. Each team participating in the rally is expected to raise a minimum of £1,000, or about $1,300, for charity. 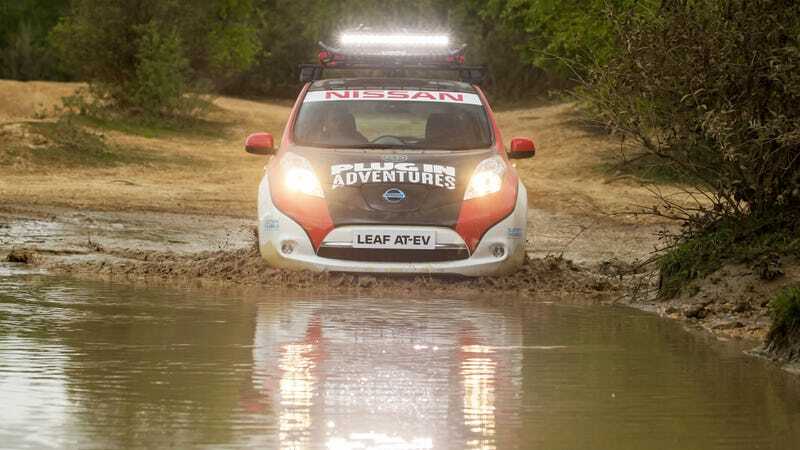 The Leaf will be the first all-electric car to attempt this rally. Participants have to use small, sub-1.0-liter engined cars because then breakdowns are likelier: drivers have no choice but to interact with locals along the way, which is extremely encouraged. They are “expected to get themselves out of trouble,” asserts the press release brightly. It’s not a timed race, so Chris Ramsey, founder of Plug In Adventures, said that it’s all about the experience. The rally starts on Sunday, July 16. I feel strangely protective of this little car. I hope it doesn’t get stranded somewhere.